Derry City manager Kenny Shiels celebrates with Barry McNamee at the final whistle. BARRY McNamee hit double figures for the first time in his senior career with a sublime 45 yard lob over the Shamrock Rovers keeper in Tallaght on Friday night. 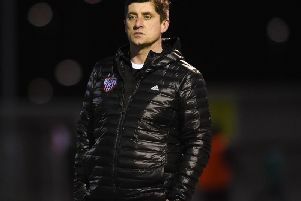 And while the Derry support among the 2,872 attendance and, indeed, his teammates erupted in wild celebrations, McNamee was the coolest man in the south Dublin venue. In typically modest fashion, the 25 year-old Ramelton man, who has taken his season’s tally to 10 goals with that stoppage time strike, said: ‘it was the same as a two yard tap-in for me’. After Aaron McEneff’s 64th minute strike gave City the lead, Rovers were hell bent on finding an equaliser until McNamee put the game to bed with a composed lob over the head of the back-pedalling Tomer Chencinski, as the City support held their collective breath until it bounced over the line. And given the magnitude of the match, McNamee reckons the goal was up there among the most important of his 35 goals in a Derry City shirt. “I was in two minds what to do,” he recalled. “I didn’t know whether to take it on another bit or just shoot. I think if I had of kept going with it the keeper would’ve got back on his line. I had a wee bit of time to line it up and I knew if I hit the target the keeper wouldn’t make it back and lucky enough it went in. Derry City supporters celebrate after Barry McNamee finds the net from just inside the Shamrock Rovers half at Tallaght Stadium. “It was a great feeling because we knew at that stage that was the three points as there wasn’t enough time for them to get back into it. “To be fair, given the defensive work we put in, it was no less than what we deserved. McNamee and McEneff have taken up the goalscoring burden this season with 10 goals apiece to lead the club’s scoring charts and Kenny Shiels claimed afterwards that ‘those two lads have made major contributions to our season’. It was a great feeling because we knew at that stage that was the three points as there wasn’t enough time for them to get back into it. City certainly appear to have Shamrock Rovers’ number in recent seasons and this latest win put the Candy Stripes firmly in the driving seat in the race for Europe with just eight games remaining. And McNamee, who scored his first ever Derry goal at Tallaght Stadium in 2012 says he enjoys playing on the big spacious pitch at the venue. “I think in the last four or five years we’ve had a great record against Rovers. We like playing down here, it’s a big pitch in good condition and it suits the way we play. “At the same time they’re a good team and are very similar to ourselves. If they had of got the first goal they would’ve been comfortable to see it out. At the end of the day we got the win and it creates an eight point gap. It’s on now to the FAI Cup game next week.